The Olympics are soon forgotten as a tide of bribery scandals engulfs the city's political elite. In less than three months Rio has passed from the splendour and success of the Olympic and Paralympic Games to a state of public calamity and chaos. The state government is bankrupt; salaries are in arrears, hospitals are at breaking point, suppliers are unpaid. The causes include the steep drop in the royalties enjoyed by Rio when the oil price was high, lavish tax breaks for favoured companies and the enshrined right of certain categories of state employees to take early retirement on full pensions. In Rio, the country’s former capital, 66% of civil servants – an unusually high proportion – have this right. This means for example, that while only 200 colonels of the military police remain on active service, 600 colonels who retired at 48 or 49, draw pensions of R$23,000 (about £5,500) each. To solve the state’s financial problems, Governor Luis Fernando de Souza, known to everyone as Pezão, literally Big Foot, proposed what some call “um pacote de maldades” – a series of austerity measures aimed almost exclusively at the lowest paid and most vulnerable. Employees earning under R$5,000 (£1,200) a month would lose 30% from their wages for the foreseeable future, social projects would be suspended, and the cheap popular restaurants – 1 real a meal – have already been closed. What’s in Pezão’s Packet of Evils? Wage Cuts? Yes, Sir! Wage Freezes? You bet! Cuts in Research Funding? Oh, yes! So outrageous were the proposals, that angry crowds of civil servants, including teachers, stormed the Assembly demanding the deputies reject them. “Call the police,” said one panicky legislator, forgetting that many of the protestors were themselves police officers. When the riot battalion arrived two of them put down their shields and joined the protesters. What became clear last week is that Rio’s empty coffers are also the result of years of rampant corruption and bribe taking on a massive scale by previous governors, all belonging to the PMDB, the party now in power with President Michel Temer. The shocking details were revealed by the prosecutors investigating this latest episode of the Lava Jato corruption scandal. Sergio Cabral, elected governor of Rio by the PMDB in 2006, and re-elected in 2010, was arrested in a dawn raid on his Leblon flat and taken to the very wing of the big Bangu prison he had himself inaugurated a few years before. Outside the prison scores of firemen, whose leaders had been sacked by Cabral in 2012 after a protest for better conditions, celebrated by letting off fireworks. Some wore white cloths on their heads, an allusion to leaked photos of Cabral drunkenly quaffing champagne at an expensive Paris restaurant. He and his friends, bosses of construction companies, had tied white napkins tied round their heads. The prosecutors reckon that Cabral received a total of R$224 million (over £53 million) in bribes from construction companies, in exchange for lucrative contracts for the vast array of building projects in Rio. These, largely financed by the federal government, were planned to precede the 2014 World Cup and the 2016 Olympic Games. They included modernizing the Maracanã soccer stadium, building a new road network, and urbanizing shanty-towns. At one point Cabral was being paid a monthly sum of R$500,000 (£120,000) by just one of the companies. His wife’s legal firm also received large payments from utility companies while he was in government, ostensibly for legal advice. It is calculated that the sums received by Cabral could have funded the popular restaurants for 4 years, or paid 11% of the state’s payroll. Cabral spent this fortune on jewels, gold watches, launches, a helicopter, and the high life of luxury restaurants. In Bangu prison, his head shaved, he now shares a cell with five other prisoners. A day before Cabral’s arrest, another ex-governor, Garotinho, or Little Boy, Antonio William de Oliveira, had also been detained accused of vote buying in the 2014 elections. Garotinho made strenuous efforts to avoid being taken to Bangu, claiming he would be killed by the drug traffic bosses he had sent there while he was Rio’s police chief. After just one night in the prison hospital, with alleged cardiac problems, a judge ordered his transfer to a private hospital. Prison’s tough. Cabral spends his days weeping in Cell C6 of Banguy Prison 8. All his assets have been seized and his funds frozen. One commentator said maybe politicians will at last improve Brazil’s notoriously terrible prison conditions, now that so many are getting a taste of them. Besides Cabral, ex- lower house speaker Eduardo Cunha, also of the PMDB, and several ex-ministers of Lula’s government, are held in Curitiba. Cabral’s arrest seems to mark a new stage in the Lava Jato investigation, switching its focus from the PT administrations of Lula and Dilma to the state governments run by PMDB governors. For president Michel Temer, it is getting uncomfortably close to home, threatening to undermine his support in congress, where efforts are underway to thwart the zeal of the judges and prosecutors. The chief executive of one of the major construction companies involved in the scandal, Marcelo Odebrecht, is said to have signed a plea bargain naming over 200 politicians from different parties. As though this isn’t enough, three of Temer’s ministers have been embroiled in controversy in the last few days. Minister of Culture, Marcelo Calero resigned in protest at the attempts by Temer’s powerful chief political minister Geddel Vieira Lima, to make him change a technical report on construction in Salvador, Geddel’s home town. This report came from Iphan, the federal agency responsible for historic areas, and recommended banning the building of a 30 storey apartment block on the very edge of an historic conservation area, where the limit is 12 floors. Having already bought one of the apartments on a top floor which would command a sweeping view of the lovely Bay of Todos os Santos, the minister was not about to let a mere civil servant stand in his way and demanded the sacking of the head of the agency’s director. Rather than do so, Marcelo Calero resigned. Meanwhile at the climate conference in Marrakesh, COP22, another Temer appointee, Agriculture Minister Blairo Maggi, who invited himself, caused dismay and anger by suggesting that Brazil’s Paris Treaty targets for cutting emissions were only intentions, and not commitments. When he also argued that farmers would not be able to pay for recovering degraded forest areas, one of Brazil’s proposed ways of meeting its targets, Carlos Rittl, executive secretary of the Climate Observatory pointed out that big farmers get huge subsidised loans which many fail to pay back, and this would provide the money. While Temer’s disastrous choice of ministers is making the headlines, in congress, his radical bill to put a lid on government spending for the next 20 years – a measure no previous government has ever attempted to enforce – is moving steadily forward, in spite of countrywide protests. Hundreds of schools and universities have been occupied by students and teaching staff. Trade unions and social movements are calling for marches and demonstrations. Last week a group of protesters invaded the Camara, smashing the glass doors, and swarming over the speaker’s table. There, calling themselves the Patriots, they demanded the return of the military, but after fistfights with some of the deputies they were ejected and arrested. It is not clear who they really are, or who put them up to it. 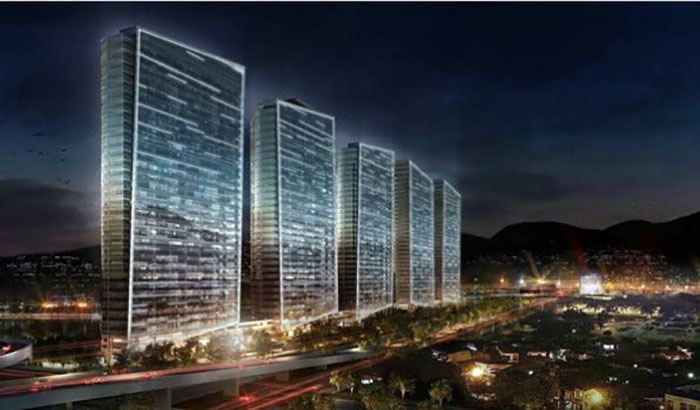 There is one bit of good news: the project to build five 38 floor giant Trump towers in the newly opened-up space in central Rio known as Porto Maravilha has been shelved because of lack of demand. Advertised as the biggest office complex in any BRIC country, critics say the project was architecturally disastrous – the blocks would have towered over the existing landscape, including historic buildings, and the all-glass façades would have made them heat traps, requiring continuous air conditioning. Worst of all, bearing the name Trump Towers would have made them a permanent reminder to cariocas of America’s frightening new president.